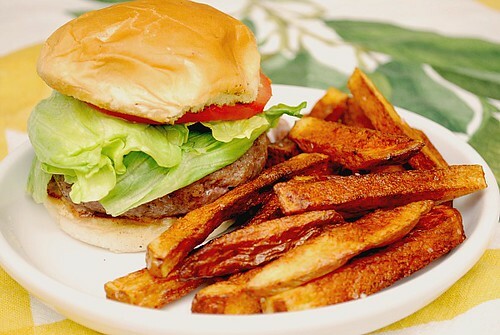 Article first published as Juicy Lucy Burgers and the World's Easiest French Fries on Blogcritics. I'm a burger girl. I'd pick a burger any day over any sausage, hot dog or bratwurst. However, my husband is just the opposite since he doesn't eat beef very often due to health reasons. So when I do make burgers at home, I have to make sure they meet my expectations. Nothing's worse than a bland, dry, burger with no flavor. Thankfully these Jucy Lucy Burgers met my expectation and then some. These burgers had a delicious cheesy surprise in the middle that will have any cheeseburger fan raving. Even better was pairing them with the World's Easiest French Fries! It was a wonderful meal that we washed down with Black Cherry Milkshakes. I can't really enjoy a burger unless there's cheese involved so when I had these burgers, I was pleasantly surprised. From first glance, there's no cheese in sight... but once you bite into it, you'll soon realize these burgers are filled with a gooey, cheesy middle. Each burger has a piece of cheese packed right in and as the burger cooks, that cheese melts ever so slowly. By the time you take your first bite, that cheese oozes out and takes this burger over the top! If you don't care for American cheese, feel free to use whatever cheese you do like. The burger is pretty adaptable so you can use the same technique with your choice of ground meat and cheeses. As for the fries, making them couldn't be easier. These are made with a cold oil method, meaning both the potatoes and oil start out cold and are cooked together slowly. Why is it so easy? Well, you simply put the potatoes in a pot of cold oil, turn on the burner and let it come to a boil. The key is not touching the potatoes at all. Let it do all the work for you! After 15 minutes, give the potatoes a little stir in the oil and let it continue to cook for another 5-10 minutes before straining them and sprinkling with salt. Easy peasy, right?! When you taste these fries, you'll be surprised how easy it was to make. They reminded me of fries I get at some restaurants. Who knew it was so simple to make at home?! In a large bowl, combine the ground beef, egg, bread crumbs, Worcestershire, pepper, salt, onion powder, and garlic powder. Mix well using your hands to really combine all the ingredients. Shape the burger meat into 4 even patties and set aside. Cut the thick slice of cheese into quarters. Taking one formed burger patty, flatten slightly and place one quarter square of cheese in the center. Work the patty around the cheese to enclose. Make sure there are no gaps or the cheese will leak out while cooking. Shape it back into a patty and set aside; repeat with other burger patties. Grill the burgers to your preference, trying not to handle the meat too often. No worries if the burgers start to leak with cheese... it happens! Continue grilling until the burger is cooked to your desired doneness. Place burgers in buns and top with your preferred toppings. Prep your potatoes by scrubbing and drying them off. Cut off the sides to square the potato off and then cut length-wise into 1/4 inch strips. Combine potatoes and oil in large Dutch oven. Cook over high heat until oil has reached a rolling boil, about 5 minutes. Continue to cook, without stirring, until potatoes are limp but exteriors are beginning to firm, about 12-15 minutes. Using tongs, stir potatoes, gently scraping up any that stick, and continue to cook, stirring occasionally, until golden and crisp, 5-10 minutes longer. Using skimmer or slotted spoon, transfer fries to thick paper bag or paper towels. Season with salt and serve immediately. Burger looks delicious but those fries look super delicious!!! looks delicious & seems soo simple (jucy lucy). would love the black cherry milkshake recipe if handy! The burger sounds amazing. Burgers are actually the only time I really care for American cheese. The way it melts in the burger is just perfect! It's ramadan and 1.5 hours before iftar (DINNER!!). I have fasted since last night. This was the wrong recipes to look at as I am craving a real american burger like nobodies business!!! Sigh, just finding a kaiser or hamburger roll is the hard part. Yukon gold-ha. Fortunately, I can adapt.